Stellar Mail Backup is a complete utility to take backups of all your mails, contacts, tasks, notes, calendar entries, journals etc. *Free Download – is the demo download of the product, which comes for a 15 days trial period. Takes backup of all mail objects, including the Emails, Contacts, Notes, Calendar Entries, Journals, SRS feeds, Signatures etc.. The utility helps taking backup of all profiles configured in MS Outlook, Outlook Express or Windows Mail email client of the system. Allows taking backup of the mail components to any desired location, including local hard drive, USB flash drive or any network attached drive. Similarly, the utility restores mails from any logical, external or network drives. Enables to schedule the backup process at your desired time with the specified backup frequency (Once, Every Day, Every Week, Every Month). The software also provides options to set the Backup Type (Full Backup, Incremental Backup, Differential Backup) and Compression level for the scheduled backup. Provides options to restore either Full Image (Complete restoration) or Specified Mail Items. The software allows restoring selected MS Outlook mails in PST/MSG and Outlook Express mails in EML format. Provides features to protect the backup file with password protection. With Stellar Mail Backup software, all your backed up data are stored in a single backup file, protected with password. The highly interactive and self explanatory user interfaces of the software provides an absolutely hassle free platform to backup mails. 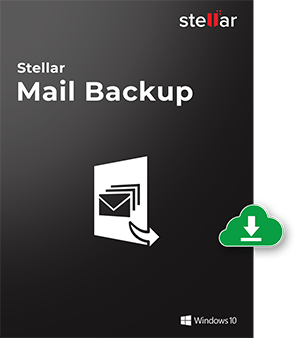 Try Stellar Mail Backup to backup mails and helps in restoring them when needed. What do you mean by Backup task? Backup task consists of the entire set of preferences made prior taking backup. There are a number of things, which needed to be taken care of before starting the backup process. Before starting the backing up operations, you need to decide on the Backup Type (Full/Incremental/Differential), Compression Level, Backup File name, Destination drive, Password, Consolidation value, Scheduling Frequency etc. All these settings combined with a particular backup operation is known as the backup task. What is the need of taking mail backup? The concept of mail backup is associated with the security concern over your important emails. Suppose that you have many important official mails with high degree of criticality, which you cannot afford to loose. For such a situation, it is wise to keep a safe copy of the important mails by taking mail backup. With Stellar Mail Backup utility, you can set the backup frequency and schedule the backup task, so that backup operation for all your important mails can be performed every day at a specified time, whereas the less important ones can be performed at the specified time of a week/month. What are the basic differences between full, incremental and differential backup? As the name suggests, Full Backup is the complete backup of the selected items, within the current time. This process takes a lot of storage space and time. However, from one full backup file, the system can be completely restored. Incremental backup takes the backup of only the recently modified files, since last full or incremental backup. As, modifications are usually minimal, incremental backup helps you avoid creating multiple copies of the same data and considers only the recent changes. Hence, incremental backup is smaller in size and quicker than the full backup. For restoring data from incremental backups, you need to have all the incremental backups and the first full backup file. The differential backup is the backup of only the files changed, since last full backup. While restoring from differential backup, you need to have the recent full backup and the latest differential backup file.